Stunning bespoke wedding cakes and decorated cupcakes perfect for all occasions; from weddings and special events to corporate parties and birthdays. From a young age, Granny Hilda taught owner Jane to bake and decorate; using her classic style and eye for detail, she taught her a wide range of baking and decorating skills. Over the years these skills lay dormant until inspired by a trip to Japan where her passion for creative baking and decorating was ignited. This started a journey to use these skills and in 2006 De Lovely Cakes was born. 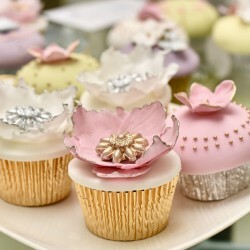 De Lovely Cakes also offer cake baking classes in order to develop your baking and decorating skills the right way!